With the Thanos event now long over, famous Fortnite streamer/music superstar Drake can finally get back to his regular “nine to five” gig. He already announced a new album in April, the weirdly Drive-adjacent Scorpion, and he’ll be going on tour with Migos for the Aubrey & The Three Amigos Live! tour starting in July. 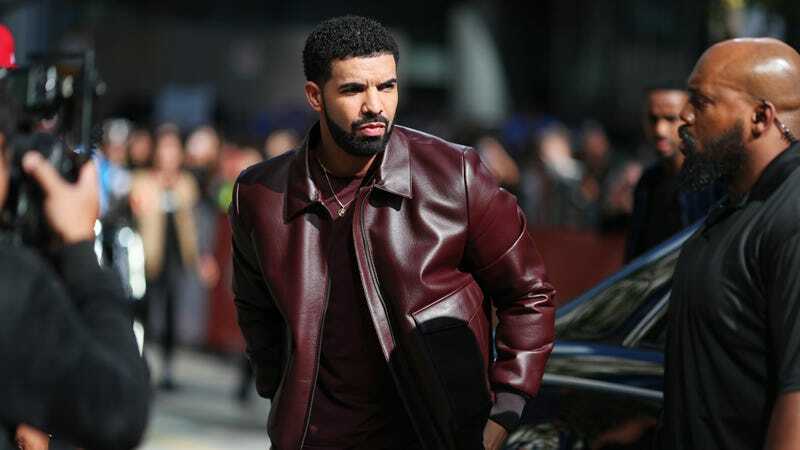 This weekend, Drake shared a new single form his Scorpion album called “I’m Upset,” and while the name implies that Drake is upset about something, Variety says it has nothing to do with an ongoing feud between him and Pusha T.
As the story goes, Pusha included a brutal takedown of Drake in the track “Infrared” off of his new album Daytona (which just came out on Friday), prompting Drake to release a song this weekend called “Duppy Freestyle” in which he calls out Kanye West (who produced Daytona and paid a bunch of money for its cover art) and takes credit for promoting Pusha’s album. The feud has taken a turn since then, with Rhymefest taking Drake’s shot at West as an opportunity to join in and ask Drake if he could throw some money at the Donda’s House charity that West founded to help young people in Chicago since, as he put it, “Kanye has abandoned” it. After that, Kim Kardashian West joined in with a Twitter thread that our friends at Jezebel have already unpacked for us. Most of that is irrelevant, though, because “I’m Upset” is not about Pusha T or Kanye West (which makes sense, since all of this stuff just started happening on Friday).